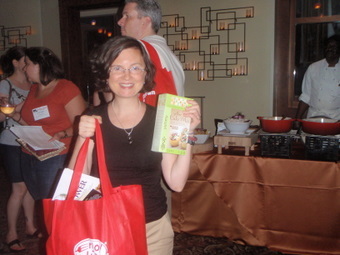 Me and my bag o’ goodies — lots of samples to take home to my son and husband, who still eat GF grains. I bought one box of sugar-free yellow cake mix from 123 Gluten-Free in case I find myself needing a GF substitute when nut flour is not allowed and I’m in a time crunch. It sure beats pre-sweetened mixes! Thanks to the vendor who sold me the box after the expo had started to close down! 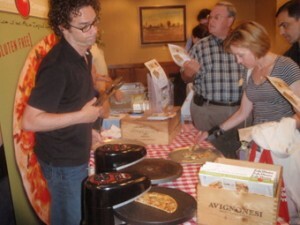 The aroma of gluten-free pizza at the D.C. Gluten-Free expo was divine. Being on a grain-free and starch-free diet since February, I had to abstain from this and many goodies that were on display and smelled so good. the Celiac Disease Program at Children’s National Medical Center exists. I have more to learn about it, but it sounds like a great resource. It’s been around since 2008, and it sounds like they really get the fact that celiac disease can affect your brain, your skin … your whole body, not just the gut. some vendors are starting to pay attention to corn as an issue for celiacs and labeling their products corn-free. more awareness of the Specific Carbohydrate Diet or the Gut and Psychology Syndrome diet. Most folks looked at me funny when I said I was grain- and starch-free. But really, rice and beans and potatoes trouble my system, and I’m not the only one! I can’t wait to take the day-long seminar with GAPS founder Dr. Natasha Campbell-McBride (on 11/11/11!) at the Mythbusters Weston A. Price Foundation conference. more awareness of corn as a food that can be problematic for many celiacs and as a GMO food. One Dish Cuisine was a notable exception; they use organic corn in their shepherd’s pie and little corn elsewhere. more vegetable content. Notable exceptions were the Bella Monica FlatBread Company and Kettle Cuisine Soups (which smelled and looked great! I will check them out for my son if our stock kettle runs dry and he’s jonesing for some soup this winter). All in all, the expo was an admirable effort with a great turnout, and I hope it helps a lot of people, especially the newly diagnosed. The reception dinner looked and smelled amazing and should be inspiration for anyone who worries that GF means a limited diet. It was a really fun event, and I learned a lot. I still have literature to go through and websites to check out. I’m grateful that I was able to attend and am looking forward to next year’s expo on June 15, 2012. WASHINGTON, July 10, 2011 — When one hears the term “gluten-free,” the smell of pizza baking is not likely the first thing to come to mind. But that’s just the delicious smell that greeted attendees at Friday’s first-ever D.C. Gluten-Free expo, thanks to Bella Monica FlatBread Company. Over 60 other vendors aimed to show the public that they want them to eat happy. From “GF” breads and burritos to breakfast bars and cereal to soup, items at the expo demonstrated that today’s gluten-free consumer has a wide range of options for prepared foods that don’t contain the protein found in wheat, barley, and rye. The Celiac Disease Program at Children’s National Medical Center hosted the expo and was the recipient of over $20,000 in proceeds from expo admission and the cocktail party that followed. Held at the Embassy Suites Convention Center in downtown D.C., the expo brought some 600 people to an exhibit hall packed with gluten-free products, most of which were available for the tasting, in generous portions. Vanessa Maltin Weisbrod, executive editor of Delight Gluten-Free magazine, said the goal of the expo and the reception was to bring together members of the gluten-free community. Vendors of foods in this growing market were already in town for Fancy Food Show, a specialty food convention open only to trade professionals. The gluten-free expo provided an opportunity for GF vendors to connect with the public that will buy their foods. It’s estimated that 3 million people in the United States – or one in 133 people – suffer from celiac disease, but many are unaware. While gastrointestinal problems are symptoms that often accompany the condition, many celiacs and people with non-celiac gluten sensitivity may have good digestion but experience growth, skin, skeletal, reproductive, neurological, psychological or other disorders. Celiac disease is also associated with other autoimmune disorders. In the last eight years, research has yielded new understandings of the disorder. And yet, in a country where the sandwich reigns supreme, a life without wheat can initially seem unimaginable. “It can be so overwhelming” when one is first diagnosed with celiac disease or gluten sensitivity, Maltin Weisbrod said. She spoke with many attendees who had no idea that so many gluten-free products were on the market, and even veteran GF eaters got introduced to some brand-new items. Exhibiting at the expo were local and regional bakeries and vendors, including Sperryville, Virginia’s Triple Oak Bakery and Wynnewood, Pennsylvania’s Main Line Baking Co., along with representatives from well-established national companies, like Pamela’s Products andEnjoy Life. Vendors passed out literature that included ingredient labels and lists of stores where products could be found. Attendees also got to take home copies of Delight magazine and samples of Lara bars courtesy of Glutenfreely.com, an online store for gluten-free products. Samples of baked goods and discounts on products and books were on just about every table. For those who are on a GF diet, it can be inspiring and encouraging to have the opportunity to enjoy such an array of safe foods among others committed to the lifestyle. Trigie Ealey and her friend Lindsey Wray, both of Arlington, Virginia, have been gluten-free for four and eight years, respectively, and both are also vegetarian. Wray was thrilled to get to try so many new products, and Ealey was impressed at the diversity of companies that are making gluten-free items. Ealey also enjoyed hearing the stories of the vendors, many of whom got into the business because they or someone in their family was diagnosed with celiac disease. Maltin Weisbrod reported hearing many attendees say they felt better about their diagnosis knowing there were so many options available to them. Few of the items were grain-free and so were not suitable for those who need to avoid all starches. An increasing number people with celiac disease and gluten sensitivity have had such damage done to their guts that they pursue the Specific Carbohydrate Diet or the Gut and Psychology Syndrome diet for a period of time. Proponents of these diets argue that substituting one type of processed GF grain product for a gluten-containing version will not allow for deep healing. As someone currently on the GAPS diet, I was not able to sample any of the products at the expo this year. But, as a mother of a gluten-free son, I’m heartened to know more options exist. If the majority of my son’s diet consists of fresh fruits and vegetables, meat, and nuts, I can live with a small percentage coming out of a box, as long as the ingredients are safe. Many GF products still use some type of corn, which has a high glycemic index and is likely to be genetically-modified if it’s not organic and shielded from cross-contamination. Several brands and items at the expo did, however, boast “corn-free” on their allergen-friendly packaging. Maureen Burke of Baltimore-based One Dish Cuisine offered that her company uses very little corn or cornstarch in the meals it provides to restaurants but uses organic corn in its shepherd pie. The expo, which was open to the public for just $10 per ticket, was followed by a “Globally Gluten-Free” $75 cocktail reception at Finn & Porter upstairs at the hotel. The impressive gluten-free spread included an Italian station with GF pastas and GF Bready brand bread on which one could pile fresh mozzarella, basil and tomato. A Mexican station offered corn tortillas and a wide range of vegetables, not to be outdone by the nearby station with lamb and chicken skewers, hummus, and a sweet potato mash. And if it were possible not to be stuffed from all the tastings at the expo and the reception entrees, a dessert room included cupcakes almost too pretty to eat, a wide array of cookies, and ice cream. 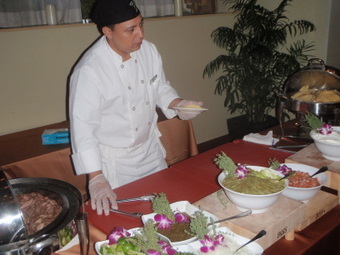 With its rich and varied flavors, the reception erased any notion of living gluten-free as doing without. 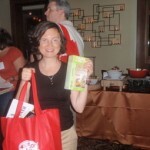 Anyone on a gluten-free journey or intrigued with this emerging trend can put June 15, 2012 on their calendar to make sure to attend next year’s expo. Please note: This post has been slightly updated. I no longer write for the Washington Times Communities.